This article demonstrates how and when to use a factory design pattern. This article begins with the intent of the Factory Pattern. This article demonstrates how and when to use a factory design pattern. This article begins with the intent of the Factory Pattern. After that, it demonstrates a logical and physical model of factory. Then step-by-step implementation of factory pattern. In the end, the article discusses how it is useful. Consider a scenario where you developed your application for a SQL Server database. And in the future you need to shift from SQL Server to Oracle database. Then you have to change your code if you have not designed your application using a factory method. Rather than creating a product directly, the client uses a factory and the factory creates the product. In physical model there is Factory which is an abstract class and implementation of this abstract class is in Concrete Factory. Similarly Product is an abstract class and implementation of this abstract class in Concrete Product. Give it the name "Product"
Response = ((System.Reflection.MemberInfo)(connection.GetType())).Name + "
Give it the name "Concrete Products"
In the above four classes you can observe one common thing which is implementation of a common abstract class. In product there is three abstract methods and you can find the implementation of each of these three abstract methods in concrete classes. 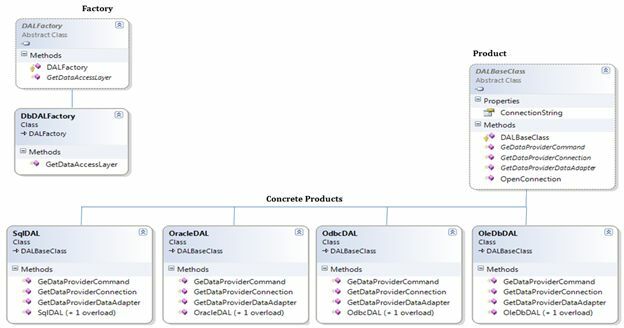 In the same manner Oracle returns OracleConnection, OracleCommand and OracleDataAdapter. And the same for the ODBC and OleDb classes. Now let's move on to the Factory. Here we create an abstract class DALFactory. We also create an enum to pass our db choice. Give it the name "ConcreteFactory"
This class implements an abstract method of DALFactory i.e. Factory. And create an object of Concrete Product. Now let's see how the client uses the factory. Give it the name "Client"
Here in the client code, we can see that the client creates an object of DALFactory i.e. Factory and Factory creates an object of Concrete Products. The main thing in this pattern is that the client is totally unaware of the concrete products. In this article, I discussed how we can create a Factory Design Pattern. We also saw intent, logical model, and physical model. After that, we saw a step-by-step implementation of the Factory Method. Hope you enjoyed reading the article. Don't forget to share the link and provide some good comments.